Budapest cake is probably one of the best cream cakes you can eat. This is my interpretation of it. It´s so easy to do. It does not require many ingredients, and even those who can not tolerate gluten can eat it in good conscience . It is really good and it should be canded mandarin segments but I had no home and raspberries is my favorites. I use almonds instead of hazelnuts because I love almonds. The whole raspberries fresh or frozen . Preheat the oven to 175 degrees . Carefully fold in sugar and remaining ingredients . whisk then further 2 min. Mix well . Spread the batter on a baking sheet with parchment paper. Bake for about 20 minutes. Remove the cake and let cool. Share it in half . And spread Nutellan and half of the cream. Add the raspberry jam. Add the second part, and a beating out the last of the cream. 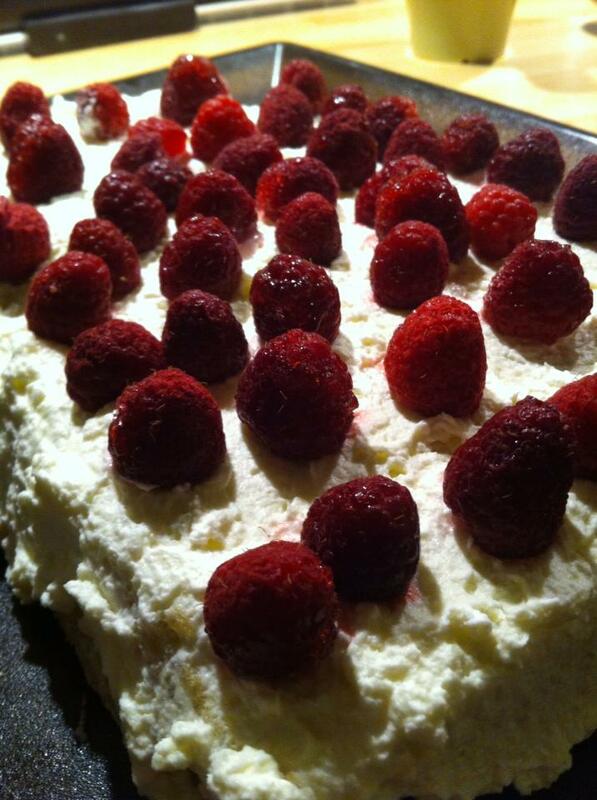 Garnish with whole raspberries. Previous Post Idas Pasta – the best pasta in the world? Does this ever look good! It would be the perfect ending for a holiday meal.